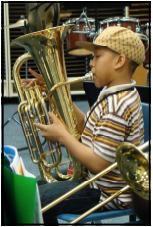 Is your child entering 5th or 6th grade, and interested in playing in band in middle school? This summer, Musical Innovations is offering a summer music camp experience for your child that will combine two of your child’s favorite things - music and FUN! Space is limited, so sign up now to reserve your child’s place! Please download the form, fill it out and mail it with a check to Musical Innovations to reserve your spot! Mini-recital for parents Friday, 11:30 a.m.
ALL participants will receive coupons for discounts at Musical Innovations this fall! Our Start Right! Beginning Band Camp will give future musicians a chance to hear and play all the instruments available in beginning band class, and will help them choose which ones are just right for them! Students will be introduced to the instruments in the woodwind, brass and percussion families. Once students have chosen an instrument, they will be taught the fundamentals of assembling their instrument, posture, plus a few first notes. They will enjoy both small group lessons, and full-band experiences. Other topics studied will include basic music theory, musical terms and symbols, and basic performance etiquette. All aspects of the camp will be taught by professional musicians with experience in school music. By Friday morning, our future musicians will be ready for their first concert, a fun demonstration of what they’ve learned for family and friends!